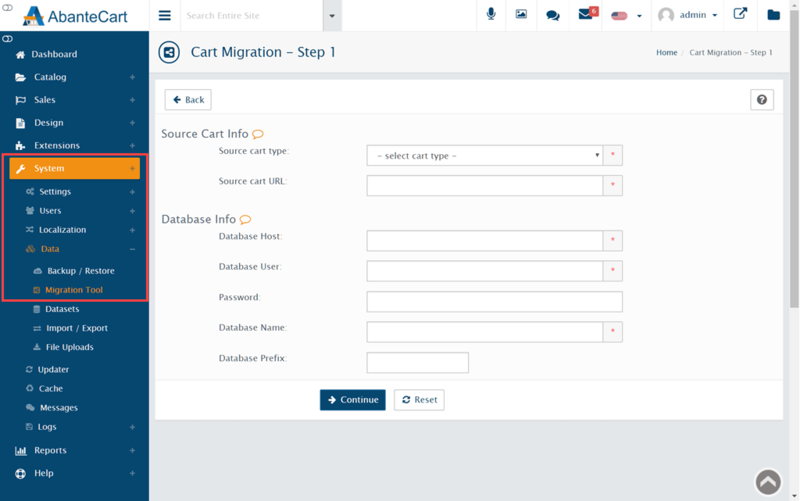 If you are moving to AbanteCart from an alternative eCommerce platform, you can take advantage of migration tools that help you automatically move your data to your new store. The tools support the import of product, category, customer and manufacturer data from popular platforms, including CRE Loaded 6.4.1. STD, osCMax2.2RC2, OpenCart 1.4.9, OpenCart 1.5.x, OSCommerce 2.2RC2, OSCommerce 2.3 and ZenCart 1.3.9h. Be sure to back up your AbanteCart installation (System > Data > Backup & Restore) as well as your existing eCommerce platform before migrating any data. To begin your migration, in the AbanteCart administration dashboard, visit System > Data > Migration Tool. Source cart type – use the dropdown menu to select your compatible eCommerce platform. Source cart URL – enter the full URL of your existing store. Database Host – you should be able to use ‘localhost’ but check the database hostname for your existing store using your server’s control panel. Database User – enter the username for your existing store’s database. Note that this will be different from your cPanel ID. Again, this should be available from your server’s control panel Databases page. Password – enter the password for your existing store’s database. Database Name – enter the existing store’s database name. Database Prefix – enter the existing store’s database prefix (if relevant). If you cannot access the information above, contact your existing store’s hosting provider who will be able to help. When you’ve completed the form, click Continue and follow the remaining steps of the migration wizard. Note that during the migration process, AbanteCart may generate login names for your existing customers if the field does not already exist. Be sure to contact your customers to inform them of their new login names if they are different from those used on your old eCommerce platform.